Known as the Battle of the Strait of Otranto, the naval skirmish took place on November 12, 1940 on the Adriatic Sea, between Italy and Albania. An allied squadron entered the Adriatic Sea looking for Italian naval targets. Unbeknownst to the Allies, an Italian navy convoy of four merchant ships - Antonio Locatelli, Premuda, Capo Vado and Catalani – were on their way back from Valona, Albania to Brindisi, Italy. The Italian merchant ships were escorted by a WWI era torpedo boat Fabrizi, commanded by Giovanni Barbini, and the auxiliary cruiser Ramb III, commanded by CF Francesco De Angelis. The ships were travelling darkened without navigational lights. The Allied squadron met the Italian merchant ships and the two destroyers at approximately 01:30, resulting in a confused night-time skirmish held in the dead of night. 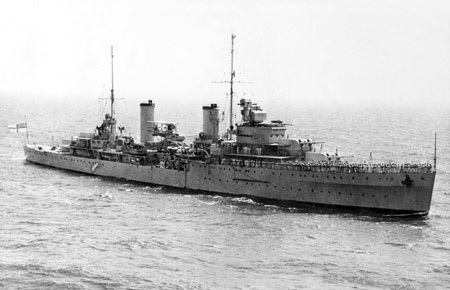 An Australian cruiser ship, the HMAS Sydney, was part of the allied squadron, and was the primary ship to open fire on the Italian merchants. Over the course of 25 minutes, all four Italian merchant ships were sunk, and the two destroyers were driven off. The Allies suffered no damage or casualties, although a torpedo narrowly missed Sydney's stern at 01:40. The day after the battle, two Italian torpedo boats—Curtatone and Solferino—rescued a total of 140 sailors.